My recent poll titled "What Is Your Experience With Israeli Wines?" has now ended. So what were the results? How did their wines fare? I don't think the results were surprising but they were informative. Based on the responses, a significant number of people still have not tried Israeli wines. About 65% of the respondents have never tried an Israeli wine. Israeli wines need to continue making their presence known to the public, and consumers need to take a chance and try some of the excellent wines coming out of Israel. About 23% of the respondents have only tried a few wines and only 12% have tried a fair share of Israeli wines. But, of those who have tried Israeli wines, the vast majority have enjoyed them. 72% of the respondents have liked most of the Israeli wines they have tried and 18% have liked some and disliked others. This seems to indicate that many people would enjoy Israeli wines, if they only took a chance and tasted them. If these wines can become more accessible, if they are more prominent in local tastings and wine stores, then they should be appealing to wine lovers. Curiously enough, only 53% of the respondents wanted to try more wines from this region. Yet 65% of the respondents have never tried these wines. If you have not tried Israeli wines before, why wouldn't you want to at least try them? And with all of those who have enjoyed the Israeli wines they have tasted, you definitely should give them a try. Please post more detail about your own experiences with Israeli wines in the comments. "Wine is one of the mysteries that mirrors the depth and inscrutability of Life itself; and as we have been taught by book and fable, it is a gift to be shared, cherished, respected, and most importantly enjoyed." Hirsch Vineyards will be having a wine dinner at Upstairs On the Square on March 26. Estate wines from Hirsch Vineyards will be paired with the inventive food of Chef Deborah Hughes at this Harvard Square classic. Jasmine will be on hand to present the wines and answer questions. Dinner includes four courses with wines to match. Price is $65 per person plus tax and gratuity. I have had their 2006 Hirsch Vineyards Bohan-Dillon Pinot Noir before and it was excellent. I will likely be at this dinner so hope to see you there as well. To make reservations, please call 617-864-1933. Addendum 3/2/09: The menu has now been posted. The Beehive presents their second annual St. Patrick’s Day festivities on March 17 from 5pm-2am. The “Erin go beehive” event will include various forms of entertainment including: step dancers, musical acts, Irish inspired ala carte food & drink specials, and a party like only The Beehive can throw. The claim from inside the hive is that while there will be plenty of surprises, this will not be your typical Irish fest. “No green beer…but what we are planning is a sophisticated evening of amazing Irish comfort food and authentic, world-class, Irish entertainment for a mature audience,” said Co-Owner, Jack Bardy. And “Authentic” is the key word! The Beehive has landed the stamp of approval for this year’s event from the Boston Irish Tourism Association, lending their co-sponsorship and officially sanctioning the event. “We’ve been more than happy to get involved with The Beehive on its St. Patrick’s day festivities here in Boston and we’re looking forward to the amazing food and festivities planned!” said Michael Quinlin, President and founder of the Boston Irish Tourism Association. One of the most exciting aspects of the event will be a special performance by Matt & Shannon Heaton presenting a virtual collage of vocals, Irish flute, guitar & bouzouki. The duet’s amalgam of traditional and neo-traditional Irish music has received critical acclaim including Shannon’s Female Musician of the Year Award by the Irish American News. In addition to serving the regular Beehive menu, Chef Rebecca Newell has created several ala carte specials including Appetizers specials such as: Corned Beef & "Cabbage" Flatbread with Sauerkraut & Cheese ($12), Mussels in Irish Whiskey with Bacon, Garlic, Cream & Parsley ($14), Irish Pub Salad with Smoked Salmon, Cheddar, Butter Lettuce & Irish Brown Bread ($12), Entrée Specials such as: Beef, Guinness & Barley Stew with Guinness Battered Onion Rings ($20), Finaan Haddie Smoked Fish & Chips with Malt Vinegar Aioli & Slaw ($19), Grilled Lamb Chops with Colcannon Mashed Potatoes ($24), and dessert specials such as their Bailey's Cheesecake ($7). There is no cover charge for this event. Reservations are recommended. Morton’s The Steakhouse, together with Napa Valley's Charles Krug Winery and the Make-A-Wish Foundation, hosts its 7th annual wine dinner. Peter Mondavi, Jr., the youngest son of the Mondavi family and owner/operator of the Charles Krug Winery, will host the four course dinner with Morton's VP of wine and spirits, Tylor Field. Each course will be paired with wines selected by Mondavi, Jr., himself. At the end of the night, guests will have the opportunity to bid on a 27 liter bottle of 2006 Charles Krug Vintage Selection Cabernet Sauvignon, with all proceeds from the auction benefiting the local chapter of the Make-A-Wish Foundation. COST: $150 per person (includes tax & gratuity). RESERVATIONS: Required, please call 617-526-0410 to reserve your spot as space is limited. Eastern Standard, well known for its cocktails, is introducing some new Savory Cocktails for the winter. These Culinaire Cocktails represent all that pertains to the kitchen and the savory ingredients typically found there. Bar Manager Jackson Cannon and team have turned to root vegetables, heirloom citrus, salty flavors and comforting, rich textures to provide a cocktail able to stand up to the depths of winter. Russian Tea Room: Evocative of borscht, Christiania Vodka infused with roasted and peeled red beets is combined with Orange Juice, Tarragon and Spicy Greek Yogurt. Mot Chaud: Literally “Hot Word”, to reflect this drink’s relationship to the venerable Last Word. Includes House-infused Vegetable Vodka, Fresh Lime Juice, Luxardo Maraschino Liquor, Cayenne Simple Syrup, Muddled Cucumbers, Celery Bitters and Salt. Berber Old Fashioned: Combines Medjool Date-infused Bourbon, Baharat Spiced Simple Syrup, Angostura Bitters and Orange Twist. Earth & Brine: The Eastern Standard answer to the Dirty Martini. Includes Reyka Vodka, Celery-infused Vermouth, Olive Brine, Regan’s Orange Bitters and Black Olive Garnish. Salsify Gimlet: Offers a thick mouth feel, combines Hammer & Sickle Vodka, Salsify Puree, House-made Seville Orange Cordial, Angostura Bitters. All Culinaire Cocktails are priced at $10. In honor of St. Patrick’s Day and this city’s historic role as a hub of Irish culture and cuisine, critically-acclaimed chefs from Boston and Galway, Ireland are joining forces at Aura restaurant to create a four-course dinner to benefit the Fisher House - a 20-unit facility being constructed that will provide free accommodations for the families of veterans being treated at the West Roxbury VA hospital. Emerald Isle-based musical sensation Celtic Thunder will be on-hand performing a special selection of Irish favorites. RESERVATIONS: Please call Stephanie Piland at 617-385-5662 to reserve your spot. I have previously eaten some exotic meats, including zebra, llama and kangaroo. And I am always open to trying other wild game and more unusual animals. So my interest was peaked when I learned that the next guest speaker at the monthly meeting of the Boston Wine Writer's would be Kate Krukowski Gooding, a self-published author from Maine who wrote a cookbook that included many wild game recipes. At the meeting, I spent some time chatting with Kate and found her to be both interesting and passionate. Her discussion on self-publishing was informative, and it was clear she was not writing for money, but out of love of what she does. Kate was also kind enough to give me a copy of one of her cookbooks. I was also intrigued that Kate would be co-hosting a wild game dinner at the Boston Wine School on April 30. Dishes will include items like Bear Salami, Braised Moose Tongue and Beaver Bourguignon. I have never eaten either bear or beaver so I am very tempted to attend the dinner. I am sure it will be a memorable meal. Since that meeting, I have taken the time to read her cookbook. Black Fly Stew: Wild Maine Recipes ($19.95) by Kate Krukowski Gooding is published by Northern Solstice Publishing LLC. It is a trade-sized paperback with 228 pages that was originally published in October 2007. The title derives from a joke made during a toast at Kate's wedding, and you can read the details of this amusing anecdote in the book's Preface. Kate is a self trained chef and wanted to write a cookbook, but decided to self-publish so that she could retain complete control over the cookbook. As a writer myself, I understand the desire for a creative person to want their product to represent exactly what they desire, and not the desires of some corporate employee who cares only about money. Yet self-publishing has its own tribulations, significant tradeoffs for your creative freedom. She has written two other specialty cookbooks: Cooking with Karen's Grass-fed Lamb and another for SweetEnergy.com. Kate is also working on other cookbooks, hopeful that her next one will be published later this year, a cookbook on lamb. Besides her writing, Kate also consults, runs cooking classes, hosts dinners and much more. The Black Fly cookbook is broken down into eleven chapters including Sides; Salads; Vegetables; Seafood; Wild Game; Birds; Desserts; Spices, Sauces and Marinades; It's Five O'Clock Somewhere; Things To Do in Maine; and Resources. It contains over 180 food recipes plus 9 drink recipes. Most of the recipes are relatively easy and most of the ingredients, except for some of the wild game, are readily available. The Resources chapter provides information for purveyors of some of the more uncommon ingredients. As this is a regional cookbook, some of the ingredients rely on items from Maine such as Maine maple syrup. Obviously you could substitute other items for such Maine specific products. The book presents a homey, Maine ambiance and you would not confuse it with a cookbook from somewhere else in the country. And yes, there are recipes that include real black flies as an ingredient, such as the Warm Black Fly Vinaigrette and Lemon Black Fly Muffins. The book though states you can substitute poppy seeds for the flies. There is an international flair to some of the recipes, including Greek, Indian, Asian and more. It seems that Kate has an eclectic palate, which is a good thing. As expected there are also a number of lobster recipes including two Lobster Mac N' Cheese recipes, Baked Maine Lobster Dip, and Simple Maine Lobster Stew. The Rocky Coast Clam Chowder is also a very traditional dish. Hearty and traditional New England dishes. The Wild Game recipes are the most intriguing items for me in the book. There are recipes for bear, beaver, goat, lamb, rabbit, venison, and moose. If you are interested in trying these recipes, you can often find these meats locally at Savenor's Market. If you are not that daring, you could easily substitute other meats, like beef, in most, if not all, of these recipes. The Birds chapter also includes recipes for game birds such as partridge, goose, and pheasant. As for the Desserts chapter, the French Crunch Peach Pie with Roasted Walnut Pie Crust most peaked my interest. A number of the recipes, mostly the entrees, came with wine recommendations, sometimes very specific wines and other times just the grape. I was intrigued to see the Bear Bourguignon paired with a 1994 Opus One, a pricey wine which might not have been your first choice with bear. My only complaint with the wine pairings is that a couple U.S. Sparkling wines, such as Korbel and Gruet, were designated as Champagnes. In actuality, only sparkling wines from the Champagne region of France can be properly labeled as "Champagne." The U.S. wines should only be referred to as "sparkling wines." There were no wines paired with the desserts. There are numerous pictures throughout the book, most in between each chapter, and the artists are from Maine. I think these enhance the aesthetics of the book. The chapter, Things To Do in Maine, provides lists of seasonal activities and events in Maine. All of this is intended to make this a regional resource. Overall, I very much enjoyed this cookbook and there are definitely numerous recipes I would like to try, including some of the wild game dishes. Kate has captured the essence of Maine, yet the book will appeal to many people outside of New England as well. Even if you dislike wild game, there are many recipes in the book that you will find useful. This cookbook is a labor of love and I believe Kate's passion is evident on every page. I heartily recommend Black Fly Stew: Wild Maine Recipes. Are you a Pat? If so, you might be able to get some free food. If your parents were smart enough to name you, “Patrick” or “Patricia” you most certainly will be lucky this St. Patrick’s Day! The Boston location of the upscale-casual Burtons Grill restaurant will be offering a special St. Patrick’s Day Promotion on Tuesday, March 17, from 11:30am to 10pm. The promotion will give a free appetizer all day long to anyone that can prove they have “Pat” somewhere in their name. “We wanted to create an aggressive and fun promotion to get people thinking about our neighborhood restaurant here in the Fenway. Of course, this is a city with a strong Irish community and we didn’t do much research on the number of “Pat’s” in the area… so we’ll see what happens,” said CEO Kevin Harron with a smile on his face. The one-day promotion is valid only at the Burtons Grill Boston location, and only one appetizer per customer. A valid photo ID will win you your free St. Patty’s Day appetizer which includes items created by Executive Chef Denise Baron such as: Risotto Fritters, Pan Seared Scallops, Shrimp Bruschetta, Grilled Zucchini and Philly Spring Rolls! Are you saving a certain bottle of wine for a special occasion? Yet have you also found that the right special time never seems to arrive? Do you keep putting off opening that bottle year after years? Well a good time to open that bottle may be very soon. February 28 is the 10th annual Open That Bottle Night (OTBN). Dorothy Gaiter and John Brecher, who write a wine column for the Wall Street Journal, created OTBN in 2000. Their intention was to give people a reason to open that special bottle of wine that remains in storage, never getting opened because the right occasion has never arisen. OTBN is always celebrated on the last Saturday in February. Dorothy Gaiter and John Brecher also encourage people to send stories about their OTBN experiences. You can also check out their prior suggestions for celebrating OTBN. OTBN has really caught on and special events to commemorate the day are held throughout the country. Many wine lovers participate and drink some incredible wines. Locally, Bin Ends is holding a special Twitter Taste Live event for OTBN. I have not yet decided how I will celebrate OTBN though I have several wines which I could open. But I will participate and hope tht my readers partake as well. If you have OTBN plans, please tell me what you will do. Or tell me after OTBN what you did do to celebrate. The theme for Wine Blogging Wednesday #55 has now been announced and it may lead to more drinking than the usual WBW event. Rémy of The Wine Case is this month's host and he has chosen an intriguing theme, one which may be quite informative in the end. The title of the theme is: North vs South. Your task is to compare two different wines, one from the "north" and one from the "south, to see how they differ." There are multiple ways in which you can do this, such as: "Northern hemisphere vs Southern hemisphere. North vs South within a country: how the Barossa compares with Tasmania. Or even within a single region: how pinots from the northern end of Burgundy compare with those at the southern end." The only restriction is that you must compare similar types of wine. For example, two wines that use the same grape, such as Pinot Noir or two similar blends. That only makes sense so that you get a true idea of how the different locations affect a wine. This should be a fun theme and will take a bit of thought to decide on which wines I will compare. On or before, Wednesday, March 18, post your tasting review on your blog. Then just add a comment on the North vs South post with a link to your review. If you don't have blog, just add your review as a comment. As for WBW #54, David of McDuff's Food & Wine Trail has now posted an extensive recap of A Passion for Piedmont. There were over 50 participants in this event and David has done an excellent job in describing all of the entries. It is well worth checking out to see all of the fascinating Piemontese wines out there. I saved the fifth winery, the Tulip Winery, for last because I was really taken by their story and they garnered my admiration for its charity and community support. The Yitzhaki family founded this winery in 2003, locating it in Kfar Tikva, near their home in Kiryat Tivon. Kfar Tikva (translated as "village of hope") was founded in 1964 on the Zaid Hills in the Jezreel Valley, near Kiryat Tivon, in northern Israel. It is a residential community, with about 200 members, for individuals with disabilities and special needs. The community was designed to assist these people realize their full potential, as well as to be able to live as independently as possible. As their website states: "To its members, Kfar Tikva represents love, camaraderie, learning, therapy, work, laughter, song, and so much more. It is their hometown, and they have reason to be proud of it and of themselves for making it so unique." It is a touching story and I encourage all my readers to visit the Kfar Tikva site and read all about this special community. The Tulip Winery works closely with the Kfar Tikva community, including hiring some of their members to work at the winery. These members work at all aspects of the wine production process, from harvest to bottling, as well as helping out with sales and vistors to the winery. Tulip also assists the community with renovations and improvements. Tulip is an integral partner to the community, and earn much admiration from me for all that they do. It is a great cause and such a compelling tale. A couple of the Itzhaki family members at the winery include Itzhak Itzhaki, the "head of the clan” and winery owner, and Roy Itzhaki, younger son and CEO of the winery. Their wine maker is Tamir Arzy, an agronomist who specialized in the vine. The winery’s vineyards are located several different areas, though mainly the Upper Galilee and Judean Hills. They believe this leads to more unique wines, reflective of different terroirs. The winery currently produces aprroximately 8000 cases of wine each year. 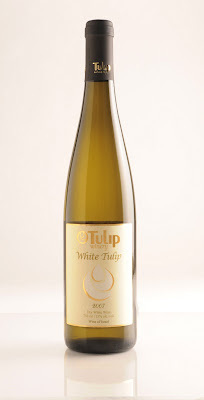 The first wine I tried was their 2007 White Tulip ($19), a unique blend of 70% Gewurtztraminer and 30% Sauvignon Blanc. This pale yellow colored wine had a prominent spicy nose that was typical Gewurtztraminer yet on the palate, the taste was much more Sauvignon Blanc with only hint of Gewurtztraminer spice. Plenty of nice citrus flavors, especially grapefruit, without any grassy taste. A crisp wine with a nice finish and the the hint of Gewurtztraminer flavors really added something to the wine. Seek out this wine! Next up was the 2006 "Mostly" Cabernet Franc ($25), which is a blend of 86% Cabernet Franc, 7% Merlot, and 7% Cabernet Sauvignon. The "Mostly" line consists of wines that are predominantly one grape, but with small additions of other grapes. They also have a "Just" line which consists of single grape wines. This Cabernet Franc was aged for about 14 months in 90% French and 10% American oak and has an alcohol content of 14.5%. Unbelievably to me, this was another Cabernet Franc that I enjoyed, that lacked any green/vegetal flavors. It seems that if I want to enjoy Cabernet Franc, I need to buy it from Israel rather than France, Long Island or California. The wine had nice berry flavors, especially blackberry and black cherry. Nice acidity, a good finish and hints of intriguing spice. Tannins were mild and this wine could be drank on its own or paired with food. The 2006 "Mostly" Shiraz ($25) is a blend of 64% Shiraz, 15% Cabernet Franc, 15% Merlot, and 6% Petit Verdot. It was aged for about 14 months in 50% French and 50% American oak and has an alcohol content of 15.2%. This is a bold, rich wine that is quite spicy with black fruit flavors and hints of eucalyptus. It is too tannic and has a lingering and satisfying finish. Another hit wine! The 2006 Syrah Reserve ($39.99) is a blend of 90% Syrah, 6% Merlot, and 4% Petit Verdot. It was aged for about 16 months in French oak and has an alcohol content of 14.8%. This is similar to the "Mostly" Shiraz except the similarities are more intense in the Reserve. The fruit flavors are more lush and pronounced, the spiciness tingles your palate, and the finish is very, very long. It is more tannic so is a better wine to pair with food. There is also almost no eucalyptus flavor, but instead there is more vanilla. A more expensive wine but one that justifies the price. The 2006 Cabernet Sauvignon Reserve ($32) is a blend of 95% Cabernet Sauvignon and 5% Petite Verdot. It was aged for about 18 months in new French oak and has an alcohol content of 15%. This is a very dark red wine with rich aromas of black fruit, especially plum. It is a full-bodied wine with lush black fruit flavors (and some blueberry), touches of vanilla, and hints of spice. The tannins are moderate, the wine is well balanced and has a lengthy finish. An excellent example of a Cabernet and a good price for the quality. The final wine was the 2005 Black Tulip ($45), their top of the line. Look at the wine label carefully, especially the picture on the left side. Unfortunately, I don't currently have a better image of that picture. From the photo at the top of this picture, you can see that the Black Tulip label is very different due to the colorful picture on the label. The winery held a contest among the members of the Kfar Tikva community to design a picture for the label. And the above picture won, a colorful abstract with intriguing geometric shapes. To me, this contest helps place Tulip's work with the Kfar Tikva community in a certain context. They could have easily created the contest for a label on one of their least expensive wines. But no, they chose to do so with their most expensive wine, the flagship of their portfolio. This speaks loudly to the world of their dedication and caring for this special community. 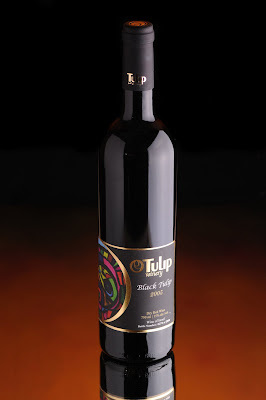 The Black Tulip is a Bordeaux style blend of 66% Cabernet Sauvignon, 14% Merlot, 14% Cabernet Franc, and 6% Petite Verdot. All of the grapes were handpicked from vineyardes in the Judean Hills and only the best grapes are used. The 2005 vintage had low yields yet high quality grapes. The wine was aged for about 30 months in new French oak and then aged in the bottle for about 6 months. Only 2900 bottles were produced and the wine has an alcohol content of 15%. This wine does remind me of Bordeaux, being very Old World in style. It has an almost purple color to it with an enticing nose of plum, black cherry and vanilla. It is a full bodied wine, with firm tannins, and lots of complexity on the palate. I tasted a well structured melange of flavors, including ripe plum, blueberry, vanilla, cinnamon, and cedar. The finish lingered for quite a long time, seemingly transforming in flavor every few months. Absolutely delicious and a wine with much potential to age well. I would pair this wine with food, though there is still a smooth elegance to this wine. I highly recommend this wine and it is well worth its price, it not twice the price. That wraps up my four-part series on the recent Israeli wine tasting. I hope you now are intrigued enough to seek out some Israeli wines. I will sure be looking for more of their wines to taste. Israel is producing some excellent wines and they deserve more respect than they currently receive. If you cannot find Israeli wines in your local area, you may be able to order the wines I reviewed from Israeli Wine Direct. My recent poll titled "What Is Your Experience With Greek Wines?" has now ended. So what were the results? How did their wines fare? Unlike the poll on the Finger Lakes, the results did not offer any significant surprises. But it did show that Greek wines seem to be doing well with those who have tasted them. Based on the responses, Greek wines still have not penetrated far to wine lovers. About 27.5% of the respondents have never tried a Greek wine. That means to me that Greek wines need to make their presence known much better than they are doing now. About 49.5% of the respondents have only tried a few wines and only 22% have tried a fair share of Greek wines. But, of those who have tried Greek wines, 60% have liked most of the wines and 35% have liked some and disliked others. Only 5% disliked most of the Greek wines they have tasted. This indicates to me that Greek wines are popular with wine lovers, once they take the opportunity to taste them. So, if Greek wines can become more accessible, if they are more prominent in local tastings and wine stores, then they should be appealing to wine lovers. This is supported by the fact that approximately 60% of the respondents wanted to try more wines from this region. Please post more detail about your experiences with Greek wines in the comments. Margalit Winery, founded in 1989, was the first boutique winery in Israel and is owned and operated by Yair Margalit and his son Asaf. The winery is located close to the Mediterranean, about halfway between Tel Aviv and Haifa. Their two vineyards are located in the upper Galilee Mountains and the village of Binyamina. They only produce approximately 1600 cases a year, all of the grapes having been hand harvested and using only free run juice. They have a passion for Bordeaux grapes so concentrate on growing those. The 2005 Margalit Cabernet Franc ($54.99) is 100% Cabernet Franc and has an alcohol content of 14.9%. I was a bit hesistant about this wine as I am usually not a big fan of this grape because it often has a green/vegetal taste I dislike. But to my pleasant surprise, this wine lacked those flavors. In fact, it reminded me far more of a Syrah. It was a dark red in color with a nose of berries and a touch of spice. On the palate, the spice was much more prominent, like a spicy Syrah, though there were also nice black cherry, plum and raspberry flavors. The tannins were moderate and the finish was long and enjoyable. Plenty of complexity, a nice structure and very satisfying. This was a Cabernet Franc that I very much enjoyed. The 2006 Margalit Enigma ($75) is a Bordeaux style blend of Cabernet Sauvignon, Merlot and Cabernet Franc and has an alcohol content of 14%. This was a dark red wine with an interesting nose of dark berries and mocha. It was a very rich, full bodied wine, a powerful wine although the tannins were very smooth. Complex flavors of blackberry, spice and chocolate. Very long finish for an exceptional wine, albeit at high price. Though this wine is probably comparable to similarly priced Bordeaux. The 2006 Margalit Special Reserve Cabernet Sauvignon ($90) is a blend of 85% Cabernet Sauvignon and 15% Petite Sirah with an alcohol content of 14%. Another dark red wine and this had an enticing nose of ripe plum and blueberry. Both of the smells also came out on the palate, lush fruit that just pleased me immensely. There were plenty of spice notes as well, tantalizing the palate, daring you to guess all the varied flavors. The tannins seemed moderate, much less than expected. The finish lingered very satisfactorily, the fruit seeming to go on and on. An exceptional wine, sensual and hedonistic. Another pricey wine but again, probably worth the price. The Pelter Winery is another family affair, having been founded by Tal Pelter in 2002 on the family farm in Moshav Zofit. But, Tal realized they would soon outgrow that space so the winery was moved to a temporary location and will soon be permanently located in the northern portion of Ramat HaGolan. The vineyards, almost nine acres, are located on the Golan. The winery produces two basic brands: the Pelter series, which are supposed to be quality value wines, and the T-Selection series, their higher-end, low production wines. They currently produce between 30,000 and 40,000 bottles each year. The 2008 Pelter Unwooded Chardonnay ($21) was quite delicious. It had a fine yellow color and a nose of tropical fruits. On the palate, there was plenty of citrus flavors, especially lemon and a bit of peach. It was crisp with a lengthy finish, just the type of Chardonnay I prefer and I would definitely recommend this wine. I previously tasted the prior vintages of the next two wines, and had enjoyed them both. The new vintages were just s pleasing. The 2008 Pelter Sauvignon Blanc ($19) was very similar to the 2007 Pelter Sauvignon Blanc except that I did not detect any grassy notes on the 2008. The 2007 Pelter Trio ($25) was also comparable to the 2006 Pelter Trio, the only real difference being that the new vintage was a few dollars cheaper. The most expensive of the Pelter series was the 2006 Pelter Cabernet Sauvignon/Shiraz ($32) a 50%/50% blend that spent about 18 months in French and American oak. This was an interesting blend of black fruits and spice. Tannins were fairly strong, making this preferably a food wine. Good complexity, nice balance and a long finish made this a very good wine. Again, I faced a wine with some trepidation, another Cabernet Franc. Yet the 2006 Pelter T-Selection Cabernet Franc ($44) lacked any green/vegetal smell or taste. I was shocked that I had found two Cabernet Francs at this tasting which I actually enjoyed. This wine spent about 14 months in French oak and reminded once again of a spicy Shiraz. There were nice berry flavors, especially some black cherry, as well as hints of cinnamon and Christmas spices. Complex, long finish, and quite delicious. The final Pelter wine was their 2006 Pelter T-Selection Cabernet Sauvignon ($38), which spent about 20 months in French oak. This wine had plenty of fruit flavors but not in the style of California fruit bomb. I expected more tannins but this was a silky, velvet wine with lush tastes of plum, blackberry, blueberry, chocolate and spice. A hedonistic wine that is well worth the price. This was one of my favorite wines of the tasting. More reviews to come tomorrow. It was an epic contest, my own Wine Battle Royale. A head-to-head competition between Apfel Eis, of Massachusetts, and Neige, of Canada, both apple ice wines. Which would prevail? Would the local wine defeat its foreign competitor? When the tasting was over, who would emerge the victor? I first encountered Apfel Eis at the Boston Wine Expo, where I also tasted some Neige, though I did not taste them together. At the time, it seemed that the two apple ice wines presented somewhat different styles and flavors. Yet I wondered how the two dessert wines would compare if tasted together and tasted blind. I was not sure the Expo really gave me an accurate comparison of the two wines. So I arranged my own private taste test. The set-up: Two identical shot glasses, marked on the bottom. I filled each glass with the two different apple ice wines and then had someone else mix them up so I would not know which was which. And then I did the same for my drinking companion. Both wines looked the same so I could not differentiate them by their color. I then tasted both wines, trying to detect their differences. To my surprise, they were nearly identical in taste except that one may have been slightly tarter than the other. My drinking companion came to the same conclusion, except felt that the other wine was slightly tarter. We both agreed though that the wines tasted essentially the same. I have tasted the two together a couple more times since then, comparing and contrasting them again, and with the same results. So does that mean the Battle Royale was a tie? No, it does not because there are other factors, besides their similar taste, to consider. First, there is price. The Apfel Eis is $24.99 but the Neige ranges from $27-$30. As the Apfel is less expensive, it gains a bonus. Second, the Apfel is made locally in Massachusetts as opposed to Neige which is from Canada. If you are concerned about buying locally, or supporting local companies, then the Apfel gains another bonus. So, weighing in those other factors, I consider the Winner to be the Apfel Eis. As I have previously successfully paired the Neige with various apple desserts, then I have no question that the Apfel Eis would do equally as well with such desserts. I have also recently paired with Apfel Eis with various cheeses, crackers and agave nectar. It paired very well with the cheeses, especially the firmer ones like Manchego though it was delicious with Cheddar too. So instead of pairing a white or red wine with your cheese plate, why not consider the Apfel Eis instead? When dining out, I enjoy the "small plate" concept, ordering a number of small appetizer dishes to share with my dining companions. These dishes can be inexpensive and you get to try a wide variety of foods. Plus it can be very social or intimate, dependent on who is dining with you. Many cuisines have their own small plate options, such as Spanish tapas or Greek mezze. In Italy, you order piattini, which means "small plate" in Italian. L'Andana is one of my favorite suburban restaurants and you can find plenty of past reviews on my blog. It generally is on the pricey side, though well worth it. But in these tougher economic times, many people find it more difficult to dine out unless they can find good values. L'Andana understands this and has introduced their own value deals, such as the Piattini Menu at their bar. You definitely should check out this new menu and you won't be disappointed. Their bar area is fairly spacious, consisting of a long bar plus numerous tables, including a wall length couch. It is a comfortable area and obviously popular. On a Tuesday evening, not when you might expect a crowd, there were plenty of patrons present both at the bar and tables. Though you can also order off the regular menu in the bar, you won't go wrong by trying the Piattini menu. Like their regular menu, it seems the Piattini menu is subject to change, so there is often something new for you to try. Currently, the menu has 13 small plate options and 3 wood grilled selections. The small plates range from $2-8, most costing $4-$5. The wood grilled selections include two pizzas and a burger, each costing $15-16. I have tried six of the small plates and all of them were excellent, perfectly prepared and spiced. The Wood Grilled Swordfish ($5) comes with a spicy almond romesco sauce. The two pieces of swordfish were moist and delicious, and the romesco sauce made for a tasty addition. It was spicy but not overly so and the almond flavor was subtle. The Grilled Scallop ($7) was accompanied with truffle whipped potato and topped with a rich, mushroom marsala sauce. Again, the scallops were grilled just right and the marsala sauce was excellent, pairing well with the scallops. The creamy potatoes were also very good and went well with the Marsala. The Goat Cheese Bruschetta ($5) has a tomato vinaigrette and you receive two long pieces of fresh bread. Along with the creamy goat cheese, there were also slices of cherry tomatoes and the spicy vinaigrette seemed to have balsamic in it. I love goat cheese so this was excellent, the creaminess complementing the acidity of the tomatoes. And L'Andana always has excellent bread, such as their complemetary Ciabatta which starts every meal, including in the bar. I was thrilled to see that L'Andana had brought back their Lemon Arancini ($4) with tomato brodo. The Arancini used to be on their regular menu and I absolutely loved them so I was disappointed when they were taken off the menu. The arancini now are just as exceptional as they were before. The outside is lightly crunchy and the interior is creamy and flavorful with just the merest hint of lemon. Lemon can sometimes overpower a dish but that does not occur with these arancini. Plus, the tomato brodo sauce is superb and I love to sop up any extra sauce with my bread once the arancini is gone. The Marsala Glazed Veal Meatballs ($6) with Parmesan polenta has also been on the regular menu, without the polenta. I enjoyed the meatballs before and they were just as good now. The Marsala glaze is quite compelling with firm, veal meatballs. The creamy polenta was also very good with a strong cheesy flavor. The Grilled Rosemary & Lemon Steak Spiedini ($5) was another dish where the lemon flavor was very restrained, and thus just right. The three pieces of tender beef had the right combination of spices, making it quite delicious. The Spicy Mediterrnean Fish Stew ($8) is the most expensive small plate but it would be a misnomer to call it small. There were loads of seafood in this dish, including clams, mussels, fish, calamari and baby octopus. Plus, a light and spicy tomato-based broth. All of the seafood was very tender and the combination of flavors was a delight. I even got to try one of their pizzas, the Margherita Pizza ($15) which comes with fresh mozzarella, pomodoro, and basil. The pizza has a very thin crust and I very much enjoyed it, especially the fresh mozzarella. Service, as usual, was excellent. This was a superb meal, with an abundance of delicious flavors and perfectly prepared. The prices are very reasonable for the quantity and quality of food you receive. They would make a nice little snack if you were having a drink, or even a complete meal if you were so inclined. I will definitely be back for more Piattini and hope to see you there. It is rare for me to attend a tasting of 20+ wines and like every single one of them. But it happened recently at a special tasting of boutique wines from Israel. Yesterday, I asked for Israeli wines to get some respect. Now, I am going to give you some specific reasons why those wines deserve respect. The Israeli Consulate to New England, in conjunction with Richard Shaffer of Israeli Wine Direct, held a wine tasting with five boutique wineries from Israel. The participating wineries include Margalit Winery, Pelter Winery, Flam Winery, Tzora Vineyards and Tulip Winery. The wine makers and other representative of the wineries were present, ready to talk about their wines and answer questions. I attended a previous Israeli wine tasting in September 2008, and though I tasted some excellent wines, there were a few I disliked. And there were only six wines at the tasting. My main complaint was that a couple of the wines had too much of a green/vegetal flavor that turned me off. So I was pleasantly surprised that at the recent Israeli tasting, I did not find a single bad wine. And this opinion was mirrored by several of my friends who also attended the tasting. Most of the wines I tasted were not inexpensive, generally costing over $20. Yet they show the potential of Israeli wines, the high quality that they can produce. I would like to see more value wines from Israeli, more wines costing under $15. Such less expensive wines can serve as gateway ambassadors to Israeli wine, especially to consumers unfamiliar with these wines. Such consumers are more likely to take a chance on an inexpensive Israeli wine. I was pleased as well to see the high degree of passion in the wine makers and representatives. They were rightfully proud of their wines and it showed that their wines were labors of love. Despite any challenges, these are people who will continue to strive to do their best, to produce excellent wines despite the odds. Now, onto the wines I tasted and enjoyed. Tzora Vineyards was founded in 1993 by Ronnie James and was one of the first wineries to to plant vineyards in the Judean Hills. Like many other Israeli boutique wineries, James feels that the most important element of winemaking is growing quality grapes. Thus, terroir is very important to James and he spent much time seeking out the best land in the Judean Hills. The winery owns three different vineyards: Giv'at Hachalukim, Shoresh and Neve Ilan. Their winemaker is Eran Pick, who received his degree from the University of California, Davis. He joined the winery in 2006, after spending some time working in Napa, Sonoma, Barossa and Bordeaux. Tzora was also the only winery at the tasting which was Kosher. Yet that was not really promoted or brought forth. The idea was simply to present their wines as good wines, whether Kosher or not. Unless you examined the bottle, you would not have known the wines were Kosher. And they tasted no different from all the non-Kosher wines at the tasting. The first wine I tasted was the 2006 Tzora Neve Ilan ($35) which is a blend of 70% Cabernet Sauvignon and 30% Merlot from the oldest plots of the Neve Ilan vineyard. This vineyard is located on the western slopes of the Jerusalem Hills, 600 meters above sea level. The wine was aged for about 18 months in French oak and has an alcohol content of 13.7%, certainly lower than many California Cabernets. I found this wine to have a deep, dark red color and an alluring nose of blackfruit. On the palate, there were flavors of ripe plum, blackberry and black cherry, along with prominent spice. It was a silky, smooth wine, with restrained tannins and a lingering finish. There was plenty of complexity here and a nice balance. This is a wine I could easily drink on its own or with food. It was certainly an excellent way to begin the tasting, immediately placing me in a very happy mood. I think this wine is reasonably priced for its quality and complexity and it is a wine I highly recommend. I should also note that a number of the Israeli wines had prominent spice notes to them. The 2006 Tzora Shoresh ($40) is made from 100% Cabernet Sauvignon and comes from the Shoresh vineyard. This vineyard is located about 700 meters above sea level. The wine was aged for about 18 months in French oak and has an alcohol content of 14%. This wine was even darker in color than the Neve Ilan and the nose was maybe a bit more restrained on its blackfruit smell. Taste wise, there were similar fruit flavors as the Neve Illan but there was less spice and the tannins were very prominent. This was to be expected as the first wine had Merlot to help soften it. This is a wine I would drink only with food, to have something to cut those tannins. It was an excellent wine, just a different style than the first one. It was nice to taste two good wines in a row. Again, I think this wine is reasonably priced for its quality and complexity and it is a wine I recommend. The last wines of the evening I tasted were from the Flam Winery. Brothers Golan and Gilad Flam founded this winery in 1998. Golan, who trained in Italy, is the winemaker and Gilad is in charge of their business strategy. Like Tzora, their winery is located in the Judean Hills. They have a small operation, only producing about 7,000 cases a year. The 2007 Flam Sauvignon Blanc-Chardonnay ($18.99) was an unoaked blend of 70% Sauvignon Blanc from the Upper Galilee and 30% Chardonnay from the Jerusalem Hills. This wine had a light yellow color and nice citrus on the nose. On the palate, there was plenty of delicious fruit, including green apple, grapefruit and pear. There was also some minerality and none of the grassiness that some Sauvignon Blancs offer. It was a crisp wine with a moderately long finish. An interesting wine that offers some character, elevating it above some one-dimensional wines. A wine that would be good on its own or with food. A great summer wine choice. The 2006 Flam Classico ($24.99) is a blend of 50% Cabernet Sauvignon and 50% Merlot. The wine is aged in French and American oak for about 6 months and has an alcohol content of 14.5%. This was a very smooth wine, with soft tannins, that provided plenty of lush fruit flavors including black cherry, raspberry and blackberry. There was only the slighest hint of spice though there was also some mild herbal notes too. Another wine that you could drink alone or pair with food. This is the type of wine likely to appeal to a very wide audience. The 2006 Flam Superiore Syrah-Cabernet Sauvignon ($40) is a blend of 84% Syrah and 16% Cabernet Sauvingon. It spent about 12 months in French and American oak. This was a very spicy wine, and very good! There were plenty of fruit flavors, ripe plum, blueberry and black cherry as well as hints of bacon. The tannins were restrained and the wine had a lengthy finish. Definitely a wine that would be best with food, maybe a nice lamb or wild game dish. Dip into something different and help three amazing charities. The Melting Pot fondue restaurants of Massachusetts and Rhode Island are offering special 4 course meals on specific dates to benefit the Multiple Sclerosis Society, the ALS Association and the Cystic Fibrosis Foundation. -----Multiple Sclerosis Society and ALS Association Events: An entrée of Filet Mignon, Cedar Plank Salmon, Memphis BBQ Pork Tenderloin, Key West Shrimp, Honey Dijon Chicken, and Spinach Artichoke Ravioli. -----Cystic Fibrosis Foundation Event:An entrée of Porterhouse Florentine, Shrimp Diablo, Sun-dried Tomato Chicken, Orange Fennel Pork Tenderloin, and Porcini and Portobello Sacchetti. Entrees served with fresh vegetables and a variety of fondue dipping sauces. Includes all cooking styles. Reservations Required. Please notify your server upon arrival to ensure that the charity is properly credited. Israeli wines are the Rodney Dangerfields of the wine world: They don't get any respect. Wine can be confusing. It is made in so many different countries and regions, from so many different grapes, and no one can know everything about all of these wines. Thus, consumers sometimes rely on incorrect preconceptions, especially if wine stores help to perpetuate those preconceptions. Trying to correct wrongful preconceptions can be an arduous task. This is a difficult challenge faced by some Israeli wine makers. I arrived a bit early for a recent Israeli wine tasting and sat down, watching everything get set up. A man sat near me, we started talking and I soon learned that he was Sam Pelter, the father of Tal Pelter, the owner and winemaker of Pelter Winery. Sam works for the winery, primarily dealing with foreign marketing. As we chatted, Sam mentioned one of the biggest challenges that Israeli wine makers face in the U.S., overcoming the preconception that all Israeli wines are "kosher." This is similar to something previously said, at the last Israeli wine tasting, by Richard Shaffer of Israeli Wine Direct. In his speech, Richard mentioned that the kosher label had been a marketing mistake. How much do you know about Israeli wines? If you are like most people, you probably don't know a lot and may also believe that Israeli wines are all Kosher. Wine stores often feed into this preconception. Many wine stores separate their wines by country or region, such as France or California. Yet when it comes to Israeli wines, these same stores generally list them as "Kosher" rather than as "Israel." So why wouldn't an uninformed consumer consider all Israeli wines to be Kosher? Sam, and wine makers from four other Israeli wineries, directly encountered this issue. They recently visited a New Jersey wine store which had a sign for Kosher wines but not one for Israel wines. Now, four of those wine makers did not make Kosher wines. They wanted the wine store to create a new Israel designation, rather than place their wines under the Kosher label. They met some initial resistance to the idea, until the wine store buyer began to taste their wines. He was so impressed with the quality of the wines, that he mentioned that he definitely would add an Israel designation to the store. What led to this success was a unified effort by the five wine makers. Sam felt that if a single Israeli wine maker had shown up, the wine store would never have changed anything, no matter how excellent the wine. Even wine store owners may have preconceptions and a single example may be insufficient to change that. But working together, a group of wine makers can help change thoughts and minds. That certainly is a good lesson to wine makers from any country or region which hopes to make inroads to consumers. This is also a lesson for consumers who want to be advocates for the wines of Israel. If your local wine store only has a sign for Kosher wines, suggest they replace it or add a sign for Israel wines. The more people that make that suggestion, then the greater the chances the wine store might make a change. There are plenty of excellent wines from Israel that are not Kosher and they deserve respect and acknowledgement. People need to learn that not all Israeli wines are Kosher and that they are well worth drinking. There are some excellent Kosher wines out there too but that is not the entirety of Israeli wine. Together, let us help educate consumers and correct their misconceptions about the varied wines of Israel. Let us give some respect to Israeli wines. As spring approaches, it is time once again for Skinner, a large auction house in Boston, to hold another wine auction. The auction will be held on Friday, March 13 at 6pm at their offices at 63 Park Plaza, Boston. Skinner’s retail partner in this venture is one of my favorite wine stores, Lower Falls Wine Co. They have not posted the catalog of lots for the auction so I don't know exactly what will be offered. The catalog will likely be posted at the end of February. With a difficult economy, many of us won't have much extra money to bid on wine, but if you do, this might be the time to find some excellent bargains. There were bargains to be found at the prior auctions, and this one might offer even more bargains, especially as there might be less people around to bid. The auction proceeds quickly and should not last more than two hours or so. I will likely attend the auction so maybe I will see some of my readers there. It is a fun event, even if you don't bid on anything. In these difficult economic times, who would start a new business, especially a high-end restaurant? Azita Bina-Seibel and her brother, Babak Bina, are the successful owners of Lala Rokh and Bin 26 Enoteca (Bin 26 being of one my favorite restaurants). They have taken a big risk by recently opening a new, high-end restaurant, BiNA Osteria, as well as a food shop, BiNA Alimentari, in the Theater District. This is a gamble that I think is going to pay off for them. Though I have not tried their restaurant yet, I have read some very positive reviews and will try to stop by there soon. But I recently stopped by their Alimentari for a sandwich. The Alimentari is a European-style shop offering specialty European goods, house-made breads and pastries, gelati, pastas, cured meats, cheeses, fresh produce, prepared meals, and a selection of artisanal wines and beers from all over the world. They have an interesting selection of gourmet items, sure to appeal to cooks looking for something different. Their wines also appear less common, not the brands you see everywhere else, and they are worth looking over. They have an excellent selection of cheese from all over the world. Prices seem comparable to other similar gourmet cheese shops. Below, you can see the case for their cured meats and prepared foods, a good variety of items. Everything looked very fresh and appetizing. They sell a number of sandwiches which you can buy to go or to eat there. The menu appears to change regularly, depending on what is fresh or in season. Sandwiches generally range from $7-$11 and are usually served on a toasted baguette with arugula, cracked pepper and olive oil. They are prepared fresh when you order. Sandwiches vary from items such as Pork Confit to Veggie, and from Proscuitto & Mozzarella to Chicken Salad. There are also prepared foods that you can order to eat, including mini-calzones and pasta dishes. The shop is open seven days a week, Monday-Friday from 8am-9pm, Saturday from 10am-8pm and Sunday from 10am-6pm. Thus you can stop by for lunch or dinner on any day you wish. Above, below the large windows, you can see the counter where you can sit and eat while you are there. The windows look out onto Washington Street so you can people watch while you eat. A nice place to relax and have a sandwich. There are not a lot of stools though, so if it gets crowded, you might not find a seat. I began with a mini-calzone ($2.50) which contained pork bolognese and parmesan cheese. The type of calzone varies each day, dependent on what the cook decides to make. The calzone had a nice crunchy exterior and the inside was a dry, spicy mix of meat and sauce. I was expecting a bit moister of an interior, though it was tasty. I then chose the Veal Buffalo Meatball sandwich ($11). This is essentially meat from a baby buffalo, which I had never had before, and it certainly resembled veal to me. The meatballs were crushed atop the bread with a very light sauce. The bread was warm and fresh, a good choice for the sandwich. There was plenty of meat inside the sandwich, and it was tender, flavorful and even a bit sweet. It certainly was not what I imagined it might be, but it was a very pleasant surprise. It was quite delicious and I highly recommend it. I could easily picture all the myriad ways you could prepare a plate of veal buffalo cutlets. Service was excellent and all of the staff made sure that all my needs were met. I will be returning here again and it is a shop that is well worth checking out. Go for lunch or dinner, buy a sandwich and watch the people on Washington Street. And while your sandwich is being prepared, check out the rest of the items for sale. Stoneham Sun: New Liquor Store? My new column of "A Passionate Foodie" can be found in the February 18 issue issue of the Stoneham Sun newspaper. This is a weekly column that concentrates on reviews of local restaurants though it also sometimes touches on other food and wine topics. The new column has been published today and will soon be available online. The new column is more of an editorial, discussing my thoughts on a new liquor store that will open in the B.J. 's Wholesale Club in Stoneham. I have some concerns that the large corporation that will own and operate the liquor store may not create the type of store I prefer. I am unsure whether this store will have a diverse selection and provide excellent service. We shall see what develops though. Burtons Grill, located in the Back Bay, is now offering a special small plates menu perfect for budget-conscious after work gatherings. For only $3.95 you can select several delicious items from their small plates menu. The small plates menu is available Monday through Sunday from 4pm-7pm and until May 31. Why not pair Burton’s small plates menu items with one of their hand crafted cocktails such as the Ciroc Pomegranate Martini or the seasonal Snow Pear Martini. Some excellent wines come from the Piedmont region of Italy and I have previously reviewed numerous wines from this area. Most recently, I met the wine makers from the Cascina Roera winery in Piedmont. On my list of Top Ten Wines Under $15 of 2008, the 2004 Le Piane La Maggiorina from Piedmont made the list. And on my Top Ten Wines Over $15 of 2008, you can find the 2007 G.D. Vajra Moscato D'Asti from Piedmont. As the theme for Wine Blogging Wednesday #54 was A Passion for Piedmont, I had to decide what Piedmont wine to review. David of McDuff's Food & Wine Trail had chosen an easy, but delicious, theme but I wanted to review something more unusual. How about a late harvest Arneis? 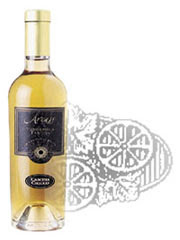 The NV Cascina Chicco Arcass is a very interesting and unique dessert wine. Cascina Chicco winery is located in the heart of the DOCG of Roero. The winery has about 20 hectares of vineyards, all of which are on hills. The Arcass is made from 100% Arneis. Arneis, also known as Bianchetta or Nebbiolo Bianco, is indigenous to the Roera region of Piedmont and records of the grape extend back to the 15th century. The word "Arneis" translate as "a difficult or demanding person" in Piemontese, probably referring to the fact that it can be a difficult grape to grow. Traditionally, Arneis was sometimes blended with Nebbiolo to add perfume and soften its tannins. Arneis was largely ignored for many years, and even might have vanished except it saw a revival in popularity in the early 1970s. Part of the reason for the revival was that there was an increasing popularity in white wines in the 1980s. Production of Arneis in Roero has been steadily increasing. Arneis is also now grown in Sardinia, Oregon, California, and Australia. Arneis has medium-small berries which are golden-green in color and elliptical in shape. It can be similar to Viognier in weight and Pinot Blanc in flavors and aromas. The flavor and aroma of Arneis may have pears, peaches, almond, vanilla and floral notes. It may sometimes have low acidity so is usually best within a year of its vintage. The Arcass is a late harvest wine done in the passito-style where the grapes are dried for several months before pressing. The wine comes in half-bottles, 375ml bottle, and costs in the mid to high $40s. It has an alcohol content of 12.5%. The name of the wine, "Arcass," is "a reference to one of the most elegant and powerful athletic gestures displayed in the game of "Balon", the most traditional sport of the Roero hills. The "Arcass" expresses the untamed farming pride, which is able to overcome any kind of difficulty." I found the Arcass to have a fine amber color with a compelling nose of apricots, citrus, honey and dried fruit. It is a full bodied wine with intense and complex flavors, being sweet without being cloying. It was a wow wine, very unique in its flavor profile and with a lengthy, satisfying finish. If this is the type of desert wine that Arneis can produce, then more producers should be making it. This dessert wine would pair with many different types of desserts, especially if there is fruit involved. I highly recommend this wine. I do love a good burger so was curious as to Four Burgers, a new burger joint located in Central Square, Cambridge. The owner is Michael Bissanti, who is also a co-owner of The Paramount on Beacon Hill. It is a small, casual place where you order at the counter and then can sit and wait for your food. Or get it for take-out. The menu at four Burgers is rather limited, basically four burgers, four sides, and a few desserts. That limitation is not necessarily a negative, especially if a restaurant makes excellent food. The burgers include beef, vegetarian, turkey and salmon and are all natural and supposed to be made fresh daily. They even reveal the source of their products, including Brandt Beef, Plainville Farms, and Blue Mango Foods. The first two companies certainly seem dedicated to natural products and sustainability issues. Blue Mango's website though is simply a single page saying little about the company. The slogan at Four Burgers is “Which one are you?”, referring to the type of burger you prefer. The basic burgers include the Hamburger ($7) with lettuce, tomato, pickles; Organic Vegan Black Bean Burger ($7) with salsa & guacamole or mango BBQ sauce; Turkey Burger ($7) with apple & cranberry chutney, lettuce, tomato; and the Atlantic Salmon Burger ($8.50) with asian slaw, soy mayo, & green leaf lettuce. You can get your burger on either a toasted sesame seed or whole wheat roll. They also have numerous items you can add to your burger, including about seven or so cheeses. You can even get a double burger if you are particularly hungry. I ordered the Hamburger with some smoked Gouda cheese on a sesame seed bun, accompanied by a side of regular French fries and some sweet potato fries. The burger is flat and smallish, about 5 1/2 ounces. The roll is fairly generic, nothing special. Taste wise it was good and I really liked the added flavor of the Gouda. But the burger was not impressive, especially for the high price. In comparison, I could have gotten a double burger with bacon and cheese at Uburger for only $5.50. I understand that natural products can sometimes be more expensive, yet I am not sure the burgers need to be as expensive as they are. As such, this is certainly not a value restaurant though I do commend their devotion to natural products. I really enjoyed the French fries though, kind of shoe string style though a bit thicker. They were cooked perfectly so you had that delicious crunchy exterior and the soft interior. They are well worth ordering. The sweet potato fries were less interesting, and I did not really think they were that flavorful. Service was very good, everyone personable and helpful. Though the burger was good, I think it is pricey. That may be the price you pay for a natural burger. One of the highlights of the Boston Wine Expo weekend did not even take place at the Expo. It was a special Expo After Party held at the Boston Wine School and hosted by Jonathon Alsop. It was an intimate party with wine lovers, bloggers, wine makers, distributors and more. There was plenty of delicious food (including some superb duck breast), interesting wines as well as lots of enjoyable conversation. It was a pleasure to meet numerous new people, some whom I have only talked to before online. I met the personable Marco Montez, owner of the Travessia Urban Winery in New Bedford. I really need to visit his new winery soon. Dave and Kathy Roberts, owners of Truro Vineyards, were also there. And that is another winery I should visit in the near future. The hyperkinetic Gary Vaynerchuk of Wine Library TV made an appearance and I spoke with him briefly. I spoke to numerous other interesting people over the course of the night and it was lots of fun. Everyone seemed to enjoy themselves immensely. Several wines really impressed me, most from the same distributor, ENO-Mass/Vinifera Imports Ltd., who import artisanal Italian wines. I knew their representative, Marc Bergeron, who had previously attended the Wine Writers course with me last year. Marc has brought other wines to the monthly Wine Writers Group meetings, and they usually are excellent. At the Expo After Party, he had three wines that especially thrilled me. Castello Romitorio is a 12th century hilltop fortress in Montalcino which was purchased in 1984 by famed artist Sandro Chia. Sandro renovated the castle, planted vineyards and constructed an impressive winery. He hired Carlo Ferrini to be his wine maker and Sandro's son, Fillipo, helps out as well. Sandro also provides the intriguing artwork for their wine labels. The 2007 Castello di Romitorio Costanza, IGT Toscano, is a blend of 80% Vermentino and 20% Chardonnay and priced in the low to mid-$20s. The wine is named "Costanza" in honor of one of Sandro's daughters. The grapes are hand-harvested from vineyards in Montalcino and Scansano. The wine sees about four months in oak and has an alcohol content of 12%. Only 5000 bottles were produced of this wine. This wine had an enticing nose of citrus and floral notes, making me want to taste it. On the palate, the wine fulfilled the promise of its nose. Flavors of green apple and pear combined with some minerality. It was a very crisp wine with a lengthy and satisfying finish. This is a wine you could easily drink alone or pair with food. The oak added only hints of spice, still allowing the fruit to shine. Everyone who I knew tried this wine really loved it and I highly recommend this wine. On the other end of the spectrum, the 2004 Castello Romitorio Brunello di Montalcino is made from 100% Sangiovese Grosso. It usually retails for $80-$90+ so it is not cheap. But this is an exceptional wine, though it should probably be cellared for a time. The 2004 vintage was considered superb, one of the best years in the last 15. This was an intense wine, with a myriad of complex flavors including rich dark fruit and spicy notes. You can taste plenty of other flavors too, from violet to chocolate. The wine is fairly tannic but some cellar aging will smooth it out. It is an impressive wine with lots of potential. From white to red, and now a dessert wine. The NV Cascina Chicco Arcass is from the Piemonte region and is made from 100% Arneis. I have never seen a dessert wine using Arneis before so this was a treat. This wine, in a 375ml bottle, costs in the mid to high $40s and has an alcohol content of 12.5%. The wine is a late harvest in the passito-style where the grapes are dried for several months before pressing. I found the Arcass to have a fine amber color with a compelling nose of apricots, citrus, honey and dried fruit. It is a full bodied wine with intense and complex flavors, being sweet without being cloying. It was a wow wine, very unique in its flavor profile and with a lengthy, satisfying finish. If this is the type of wine that Arneis can produce, then more producers should be making it. This dessert wine would pair with many different types of desserts, especially if there is fruit involved. Hopefully this was only the first of many more Expo After parties that Jonathon will hold. The size of the venue, the Boston Wine School, will keep the party on a small scale, and thus more intimate. That allows you a better opportunity to chat and socialize with the others, as well as to enjoy all of the food and wine. It was a memorable evening and I am very glad I attended. The Allagiannis Winery, located in the heart of Attica, is a small, boutique winery founded by Dimitris Allagiannis. Dimitris had been involved in wine for about 25 years before establishing his own winery. He now works with his son, Vassilis, trying to earn Greek wines an even greater reputation. The 2007 Mantinia Allagiannis is made from 100% Moschofilero. It has a bright yellow color with an intense citrus smell. On the palate, it was full-bodied and almost creamy with flavors of lemon, orange and peach. It had a moderate finish and good structure. Would make a good food wine, or you could drink it on its own. The Santorini Winery, located on the island of Santorini, has been owned and operated by the Karamolengos family since 1995. The 2005 Santorini Vin Santo is made from Assyrtico & Aidani grapes that have been sun-dried and then aged for two years in oak. This wine had a rich amber color with an enticing nose of caramel, vanilla and tropical fruit. On the palate, it had an intriguing melange of flavors including some unique fruit with strong caramel tones. It was not overly sweet and was a very smooth drink. A delightful, lingering finish that you did not want to end. Highly recommended. These wines are all imported by Hellas Import Ltd. It is that time again, time to check out the special value meals at over 200 participating restaurants. 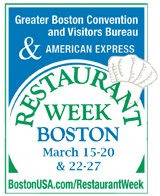 Winter Restaurant Week Boston® will be held March 15-20 and 21-27, 2009. You can view all the participating restaurants, peruse their menus and make reservations through Open Table at www.BostonUSA.com/RestaurantWeek. Participants can choose from over 209 of the region’s best restaurants and enjoy three-course prix fixe lunches for $20.09 and three-course dinners for $33.09 – excluding beverage, tax and gratuity. A new menu option this year is the two-course gourmet lunch priced at a very affordable $15.09; diners can select an entrée and then enjoy either an appetizer or dessert as the second course. Some restaurants will even participate on Saturday, March 21. Along with prix fixe menus at the region’s best tables, participants are encouraged to take advantage of special hotel packages during the two week promotion. Special offers can be easily accessed on Boston’s official visitor website www.BostonUSA.com/RestaurantWeek. In addition, when diners use any American Express® Card at participating restaurants, American Express and the Greater Boston Convention & Visitors Bureau will donate $.25 per transaction, up to $5000, to Community Servings, an independent, non-profit organization whose mission is to provide free home-delivered meals throughout eastern Massachusetts to people homebound with HIV/AIDS and other acute life-threatening illnesses. New restaurants to Restaurant Week include places including: Amelia's Trattoria, Asana, Bina Osteria, BOND, East Coast Grill, Estragon, Limoncello, Marliave, Sportello, Stella, and Tomasso Trattoria & Enoteca. You can even become a fan of the Restaurant Week Boston® page on Facebook or follow Restaurant Week Boston® on twitter at www.twitter.com/bostonRW. After tasting so many different Greek wines, I ended this phase with three dessert wines. I would taste some more Greek wines later, though at a few different tables. As for the three dessert wines, they were a mixed bag. I began with the N.V. Achaia Clauss Muscat de Patras which is made from the Muscat Blanc grape. This wine had a rich, golden color (almost orange) and it had a strong nose of apricot and nuts. On the palate, it is a very thick, full-bodied wine with flavors of apricot and orange. It was very sweet, though almost cloyingly so. I was not a big fan of this wine. The N.V. Achaia Clauss Mavrodaphne of Patras is made from the indigenous Mavrodaphne grape. This wine had a dark brown color and a nose that reminded me of a Tawny Port. On the palate, it again reminded me of Port, with flavors of black cherry, dried fruit, and a nutty undertone. I liked this wine and would drink it though it was not very impressive. 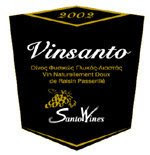 But the third dessert wine, the 2003 SantoWines Vin Santo was impressive. The Vin Santo is made from sun dried grapes, 75% Assyrtico & 25% Aidani. The grapes are sun dried for about 8-10 days and then the wine is aged for about two years in oak. It had a rich amber color and an enticing caramel and nut smell. On the palate, it had a nice sweetness that was not overbearing with flavors of vanilla, caramel and spice. There was plenty of complexity and a nice, long finish. This is a wine that should appeal to most people and something I highly recommend.